Bacon Burger Dog. Tyson Food Inc. This is a clever twist on the classic bacon-cheeseburger. 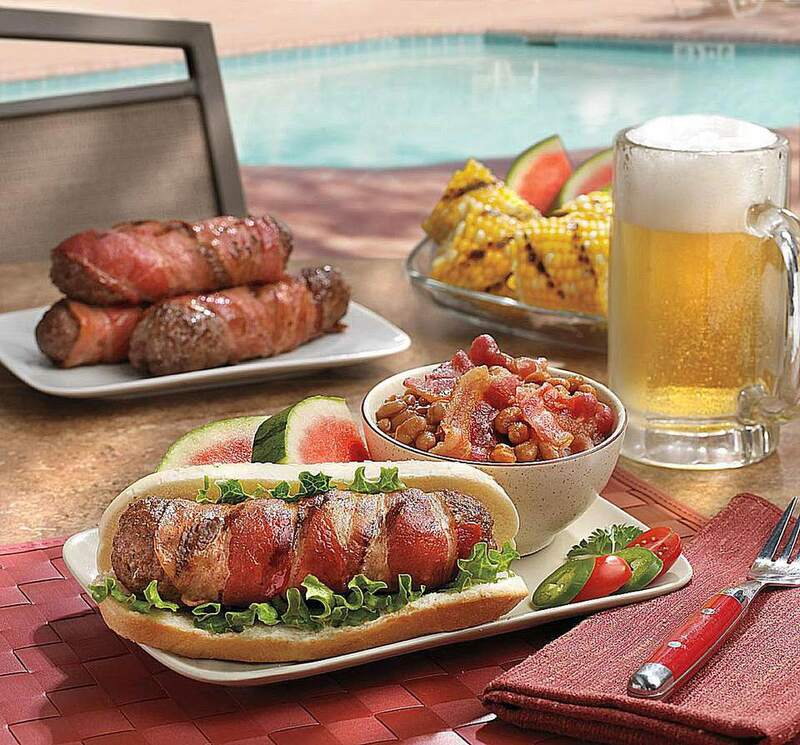 Load the ground beef with bacon, form into hot dog shaped patties, wrap in more bacon and grill. Stuff into a hot dog bun with cheese and jalapenos and you have a great burger (or is it a hot dog?). Feel free to tinker with this recipe. I do suggest wrapping with bacon since this helps to hold it together. However, you can omit the extra bacon inside the burger dogs themselves. While the grill is preheating, mix ground beef, salt, pepper, and Worcestershire sauce in a medium bowl; set aside. Cook 10 strips of Wright Brand Smoked Bacon according to package directions. Allow to cool slightly, then coarsely chop. In another medium bowl, gently toss the cooked bacon pieces with jalapenos and cheese; set aside. Divide burger meat into quarters and roll each quarter between two pieces of plastic wrap to a 6-inch by 4-inch square. Place 1/4 of the cooked bacon, jalapeno, and cheese filling down the middle of each square. Roll and seal meat into hot dog shape. Wrap each burger dog with two strips of uncooked Wright® Brand Smoked Bacon from end to end, securing with a toothpick. Place burger dogs on a medium-hot grill and cook approximately 15-20 minutes with lid closed, turning every 2-3 minutes or until cooked. Remove burger dogs from the grill, place on hot dog buns and enjoy!